Introduced by Gina Grillo, President and CEO of The ADVERTISING Club of New York, and Michael Roth, Chairman and CEO of IPG, the event included a panel of leading Black women from our industry. The panel was moderated by Joy Reid from MSNBC and also included Jocelyn Carter-Miller, President, TechEdVentures and SoulTranSync and IPG Board Member; Pam El, EVP, Chief Marketing Officer, NBA; Vita Harris, EVP, Chief Strategy Officer, FCB; Jeanine D. Liburd, EVP of Marketing, Corporate Communications and Corporate Social Responsibility, BET Networks; Lisa Price, SVP, Founder & Creative Director, Carol’s Daughter and Carol H. Williams, CEO and Chief Creative Officer, Carol H. Williams Advertising (CHWA). Tai Wingfield, from the Center for Talent Innovation (CTI) presented current research about Black Women professionals during THEIR TRUTH, and Valerie Graves, author of “Pressure Makes Diamonds: Becoming the Woman I Pretended to Be,” presented a reading from her book. The event hashtag, #impartoftruth, was the number two trending topic on Twitter and the summit has been viewed by more than 15,000 people via Facebook Live. 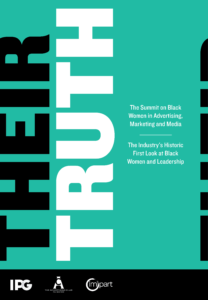 The most recent EEOC Facts on Black women in the U.S Ad Industry show that there are only 93 Black women executives across all U.S. ad, PR and related agencies with 100+ employees, out of a total of 8,734 executives. And, among major demographic groups in ad, PR and related industries, Black women have the lowest upward mobility. The research from CTI shows that Black women are 2.8 times as likely as white women to aspire to a powerful position with a prestigious title; 43% of Black women are confident that they can succeed in a position of power, and 54% of Black women out-earn their spouse or partner. “We are overwhelmed by the response to THEIR TRUTH,” commented Heide Gardner, SVP, Chief Diversity and Inclusion Officer, IPG. “The live attendance and the extraordinary traction on social media demonstrate the enormity of the issue. The fact that so many IPG CEOs attended the event, and brought women from their teams with them is phenomenal, and an important first step toward making real change on this issue. We look forward to continuing our work and making an important difference in our industry and in the lives of our people,” she continued.